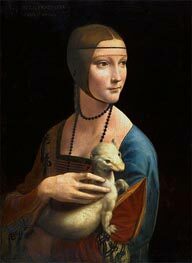 To paint your Leonardo da Vinci Hand-Painted Art Reproduction time is needed. The painting should not be made too hastily, nor should any deadlines be pursued. For the painting to acquire high quality and precision of detail, time is necessary. It also needs time to dry in order to be completely ready for shipping. Depending on the complexity, the level of detail, and the size of the painting, we'll need 6-7 weeks to make the painting. We do not frame our oil painting reproductions. Hand-Painted Art Reproduction is an expensive product, and the risks of damaging a painting stretched on a frame during transportation are too high. The Annunciation by Leonardo da Vinci is, therefore, not framed, and will be sent to you rolled up and packaged in a strong and secure postal tube. Your The Annunciation Canvas Print is individually hand-made, using sophisticated digital technology. The process of Giclée print technology imparts to the Art Print a vivid clear color, an incredible level of detail, and the authentic charm as from a museum original. If you have chosen a Canvas Print of Leonardo da Vinci without a frame, it would be ready to be sent to you within 48 hours. However, if you have chosen an art print stretched on a frame, then the process of printing and framing will take about 7-8 days. The unframed print of The Annunciation will be shipped rolled up in a postal tube. The framed Canvas Print will travel packaged in a cardboard box with additional corner protectors. The Annunciation (1472-1475) is a painting by Leonardo da Vinci in the Uffizi Gallery in Florence. It depicts the annunciation by the Archangel Gabriel to the Virgin Mary that she will conceive Jesus Christ and is set in the enclosed courtyard garden of a Florentine villa. The angel holds a Madonna lily, a symbol of Mary's virginity and of the city of Florence. It is supposed that Leonardo originally copied the wings from those of a bird in flight, but they have since been lengthened by a later artist. When Annunciation came to the Uffizi in 1867 from the monastery of San Bartolomeo of Monteoliveto, near Florence, it was ascribed to Domenico Ghirlandaio, who was, like Leonardo, an apprentice in the workshop of Andrea del Verrocchio. 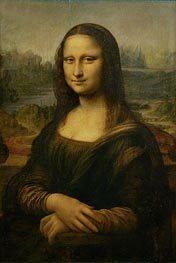 In 1869, some critics recognized it as a youthful work by Leonardo. 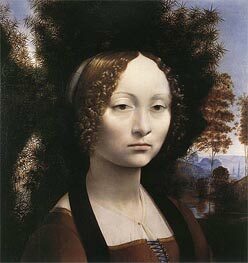 Verrocchio used lead-based paint and heavy brush strokes. He left a note for Leonardo to finish the background and the angel. 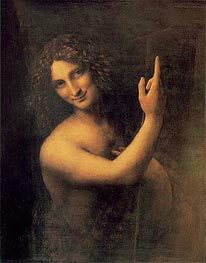 Leonardo used light brush strokes and no lead. When the Annunciation was x-rayed, Verrocchio's work was evident while Leonardo's angel was invisible. The marble table in front of the Virgin probably quotes the tomb of Piero and Giovanni de' Medici in the Basilica of San Lorenzo, Florence that was sculpted by Verrocchio in this same period. The background shows a Harbour scene that is believed to be at Rome.